Running has always been a bit of a selfish thing for me. One of the main reasons I run is the fitness, as I don’t like going to the gym. I am a medal whore. I cannot help myself. Academically I always have done well, but athletic achievement was never more than year/class football and rugby games at grammar school. The only medal I was awarded before the age of 39 was for participation in a gymnastics display, at the age of 15, and I was given the wrong one anyway. My first race and medal was the BUPA London 10K May 2012 and I ran it for Diabetes UK. I ran Sheffield for Help 4 Heroes and the Royal Parks for MS Society but mostly to get a place. For the most part I run for myself. 36 race medals hang from the racks on the walls but the me vs me and my PBs challenge is getting a little stale for me. I do not like to be in the pain a hard race leaves me. So really my racing has been a trip somewhere, B&B or hotel, race, medal, then cheeseburger and beer lunch and a blog review. I could have given myself more impetus by joining a running club. I did mail City Runners and am subscribed to the emails but have not run with them yet. I have Twitter contact and have met up with representatives of Run Dem Crew. Morningside and Ealing racers I see on my travels too. But in the end I decided to dedicate the rest of the year, or the 20 races from Hastings half onwards to a single charity. My family has been fortunate enough not to suffer from hereditary illnesses. My grandmothers died at ripe old ages, grandfathers, in the age of beef dripping before we had a gym on every corner, of more coronary related shock. So when deciding on a charity to run for I had to dig deeper. My mother’s grandmother, or “other nan” as I knew her, the original nan mine seemed to be based on, who I only remember for Saturday evenings of Jim’ll Fix It, The Muppet Show and Dr Who, according to my mother died of Pancreatic Cancer. I did not know this. A dear friend’s (NB) father died four years ago of the same disease. And another friend’s grandfather (AB). The shock still apparent in all because of the nature of the illness. It is one of those that silently sneaks up on you. And when it is diagnosed, the survival rate is ashamedly low. The funding for Pancreatic Cancer research is so low that this e-petition has been created. And when running the Hastings Half this weekend, I was one of only 2 runners out of the thousands who wore the purple and orange of Pancreatic Cancer UK. Something has to be done about this. 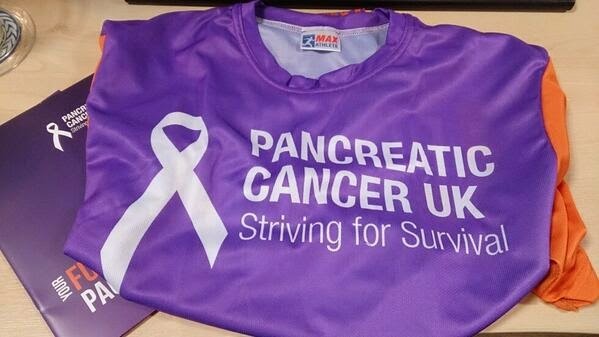 And so, I am doing everything I can to raise awareness, and am running 20 races for sponsorship, with all proceeds going to Pancreatic Cancer UK. I know that what I can achieve will be a drop in the ocean, I would love to raise a couple of thousand minimum and, at the time of writing have £450 after 1 race, so anything is possible. 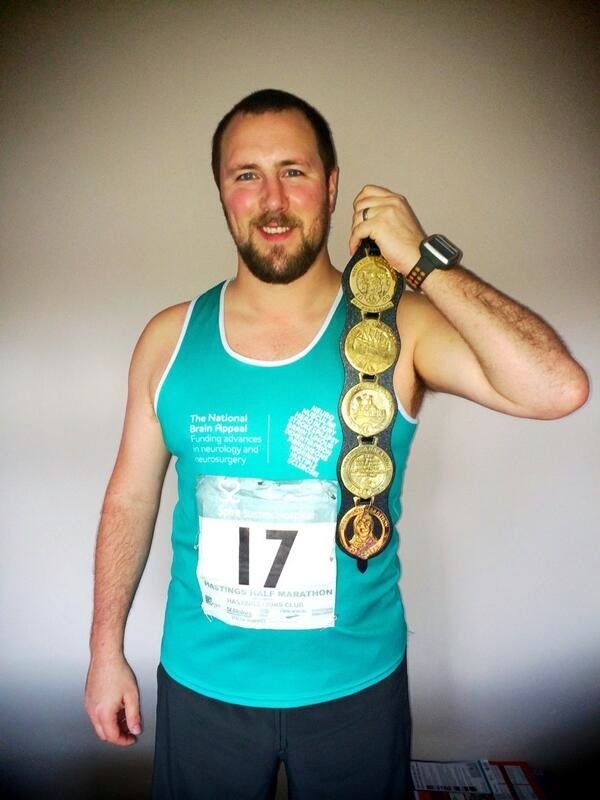 My JustGiving page will show my progress in both terms of donations and the challenge. And I hope others will get involved too. All my races I pay for, all my travel and all accommodation. Pancreatic Cancer UK are spending nothing on me. However, if they do have slots on races I would gladly take them as part of the challenge. Injuries permitting, and timing will make a difference, but I aim is to have run all 20 races by the end of October, so 7 months. 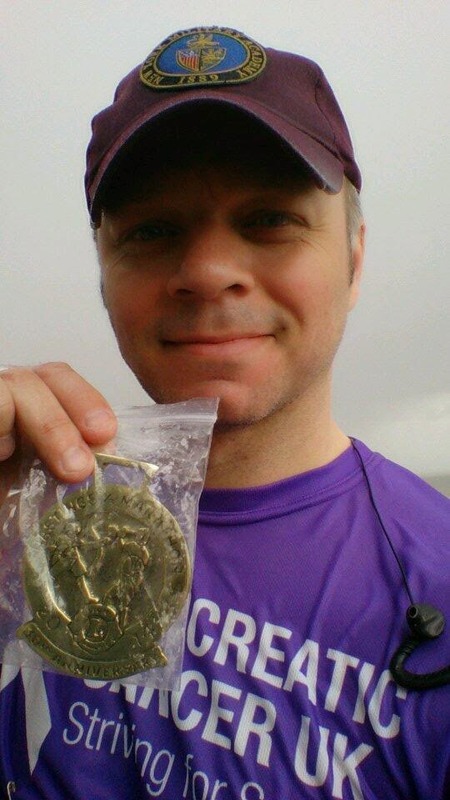 This was my first race for Pancreatic Cancer UK and was off the back of 3 halves in 4 weekends. 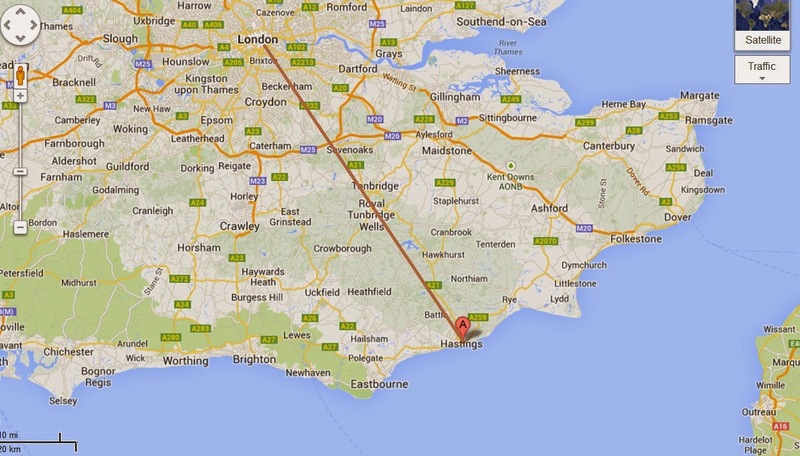 This should have meant that I was ready for my trip to the East Sussex coast but a few things conspired against me. First, the hotel I stayed at, the Lindum, was freezing cold and this woke me up through the night. And second, The weather was being it’s bipolar self at the time. It was destined to be sunny, but was only 4 degrees when I woke up to head to the start of the race. Indeed, after finishing I ran back to the hotel for a shower and cheeseburger only for the heavens to open and a hail storm to signal my triumphant return. 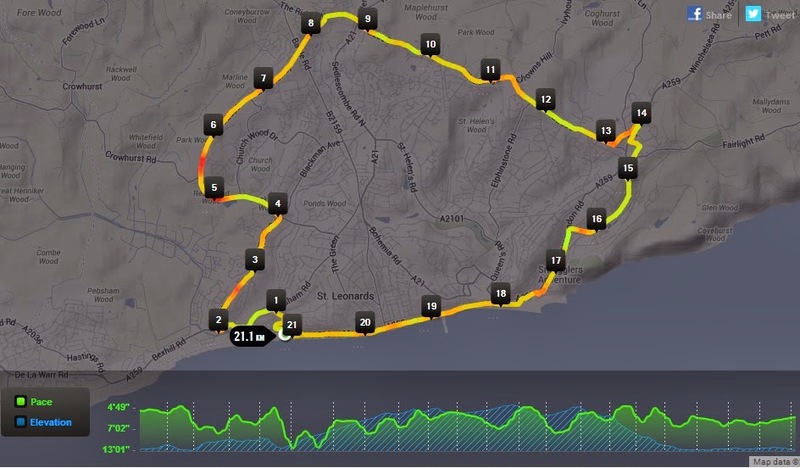 Starting just along the seafront the race wound out of St Leonards and immediately up. Up and up it wound, through little villages and by the much maligned Link Road dig. I did see a lot of “LINK ROAD STINK ROAD” vests. I also saw a couple of guys dressed as rhinos and a solitary running in the purple and orange that matched mine. Due to the cold start I wore a long sleeved thermal top under my tshirt. This was a mistake as I had to stop and strip on the side of one hill and then tie the top around me for the rest of the race. A nice sized mini bottle of water worked well from Boots that allowed me to bypass the disaster that are water stops but it did mean that I needed the toilet soon into the race. The biggest problem with the race, in my opinion, being that there were no portaloos on the course. They were only at the start and thus, you had to either use a tree, or wait until the end. Me? I suffered with a full bladder until mile 11, when we returned to the Hasting seafront and ran into one of the public toilets there. I was slow, but really, this isn’t a sprint. I will, as promised to several of the sponsors, beat my PB’s for both 10K and half. I ended so strong I sprinted the 3K back to the hotel. The medal is not a medal, it is a horse brass. And, although this is fine for all those collecting them and keeping them on a leather martingale, shown below as modeled by Steve Smith. The photography is pretty poor. For 3 days only 55 pages of 518 have shown the photos from the race, so there is no Obligatory Race photo for me to send to the charity. Very disappointing. 6/9 Somerset Levels and Moors Marathon known as the SLAMM (and Half). My clubs race 🙂 run on a saturday, cheap and cheerful, off road. 7/9 Cheltenham Half – again easy train/accomodation wise!